Grain-free granola is my longest post to date. But bear with me and read it all and watch the videos, because if you can understand what is wrong with breakfast cereals, you will understand what is wrong with modern food production, marketing, whole grains, the Heart Foundation tick, why low fat is so bad (and can actually increase your risk of heart disease) and how sugar has found its way into everything we eat. So why is regular “healthy” cereal so bad? It’s full of whole grains, right? Full of vitamins? Part of a balanced day? Starts you off well and keeps you full? It’s organic and so must be healthy? These are all myths. The invention of breakfast cereal is one of the first convenience foods. They are cheap to make and are seen as an easy answer to the morning schedule. They have become nothing more than a bowl of sugar, corn or wheat, with milk and vitamins added. They have almost become desserts. They are packaged in bright, vibrant, exciting packages aiming mainly at children. Or the “healthy cereals” usually have fields and nature on the front, and typically in brown recycled paper boxes, to somehow give it “sustainable and healthy” credentials. And if you think it’s just coloured children’s cereal which contains high amounts of sugar, think again. Watch the video below to see how much sugar (natural or not) is hidden in even “healthy” cereals. UPDATE – One reader sent me his stable blood glucose readings after enjoying my grain-free granola with berries and unsweetened yoghurt. Now add in a glass of “natural, healthy” fruit juice, and you have gone over your limit of sugar for the day. But trying to get people to understand why a wholegrain cereal and a glass of juice is so bad, is pretty much like hitting your head against a brick wall. That is the power of the food advertising and marketing industry. Fast forward to 7 minutes, and see how cereals all stem from one place, 2 brothers and Battle Creek! This is fascinating. See how the Kellogg’s brothers split and how sugar added to cereal began. How they bought cheap grain for 75c and make $12 of cereal! Whole grains are high in carbs, raises blood sugars dramatically, causes insulin spikes, increases appetite, causes leaky gut, malabsorption of vitamins, full of gluten, gliadin, and amylopectin A. Modern wheat (which is NOT the same as wheat eaten by our ancestors for centuries) may be a trigger for autoimmune disease such as type 1 diabetes, dementia, multiple sclerosis, rheumatoid arthritis, psoriasis to name a few. Take home message – Wheat is a rapidly absorbed carbohydrate with a high GI full of reactive proteins causing a leaky gut. Another myth fed to you by the cereal industry. This is because they are fortified with synthetic vitamins and minerals. Cereals are stripped of their nutrients during processing and they are fortified, they become socially acceptable processed grains. Why do you think they show a bowl or cereal with milk and berries? To give you the idea you are eating a balanced breakfast. The cereal itself is almost incidental to the vitamin intake from the fortification or the added fruit and dairy. By adding vitamins and minerals, cereal manufacturers can make health claims and increase sales. In fact, many kinds of cereal only receive health star ratings due to the addition of dairy to the serving. To produce corn flakes, they take the kernel and remove the outer husk, to allow the sugar, malt and salt to penetrate. They remove the inner germ which contains oil because the oil goes rancid and would shorten the long shelf life and reduce profit. It gets cooked, dried, rolled out, toasted, They turn cheap grain into premium products by way of marketing, advertising, fortifying and processing. Take home message – cereals are not packed with naturally occurring vitamins, they are fortified and ultra-processed. Yes, organic products are great and don’t have the pesticides and residues of other cereals, but this doesn’t change their carb/fat/protein content. Sugar and carbs will raise your insulin no matter whether they are organic, natural, or highly processed. Sugar, honey, Medjool dates, dried fruit ALL are seen by the body as sugar and raise insulin, increase appetite, stop fat burning, and promote fat storage. Take home message – organic cereals can be just as high carb/sugar as the non-organic products. Low-fat merely means they have reduced the original fat content. But what was the fat replaced with? You guessed it, sugar. Next time you are in the supermarket, compare 2 products that are regular and reduced fat (or lite). Look at their carb content and sugar content. I’m guessing you’ll find the reduced fat cereal (or any reduced-fat product for that matter) is higher in carbs. Why? Because when you remove something, you have to replace it with something else, and sugar adds flavour and acceptability. Take home message – low-fat products have the fat removed, and have sugar added to give it flavour and substance. Myth 5: It Has A Heart Foundation Tick So Must Be Good For My heart? Again this is marketing. Firstly there are major calls for the Heart Foundation to totally reassess their recommendations on fats and sugar, and secondly, companies essentially re-formulate their products to fit the criteria to receive the Heart Foundation Tick. Study after study has repeatedly shown that low-fat diets do not stop heart disease, but may actually increase your risk. The fact that cereals containing 27% sugar can be awarded the tick, is pretty outrageous. This Milo cereal pretty much sums up all of the above myths. 1. Contains whole grains, wheat and corn (remember, cheap grains are processed into high priced, socially acceptable cereals). 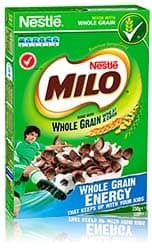 And by containing these grains milo cereal contains a whopping 72% carbs (64.4% net) and 27.3% sugar. What??? And they still get the heart foundation tick? 2. Packed with vitamins – the ingredient list shows added calcium, magnesium, iron, zinc, vitamins A, C, B1, B2, B6 and folate. 3. It’s not organic, so at least they can’t claim this health benefit. 4. Low in fat – Low fat, but look at the 72% cabs. Low fat, so we are hungry in an hour. Low fat, and so low in vitamins A, D, E and K. We don’t want low fat. Fat is good, it makes us fuller for longer, fat is packed with our fat soluble vitamins. 5. Heart Foundation Tick – so a cereal can contain 64.4% carbs and 27.3% sugar and still get a Heart Foundation tick! I know your morning is busy, but here is what we have for breakfast every day. My children make their own, or it takes a minute or 2 to make a cooked breakfast in the microwave. Make a big batch of grain-free granola and it will last a week or 2. Make chia seed breakfast the night before. Microwave scrambled eggs with cheese and any leftover veggies. Microwave 2 slices of bacon for 2 minutes covered with kitchen paper. Yoghurt and coconut cream with berries. Once you learn how to make the basic grain-free granola, you can experiment with all the flavours you currently love. I have already made cinnamon grain-free granola, fennel and ginger grain-free granola and chocolate grain-free granola. I am still developing more flavours, so make sure you belong to my newsletter, and don’t miss out. Make this big batch of grain-free granola and it will keep your family going for a couple of weeks. The perfect way to get your family off the sugary cereals/granolas. Place all the coconuts, seeds and nuts in a large roasting or baking dish with high sides. Melt the coconut oil and add the cinnamon and ginger. Pour over the grain free granola mix and mix thoroughly with a large spoon or spatula. Make sure everything has a fine coating of the oil and spices. Bake at 180C / 350F for 20 minutes. The mixture can burn very easily so I turn the mixture with the large spoon every 3 minutes. Allow to cool thoroughly and place in airtight containers. Add any other spices or flavourings you may enjoy such as orange zest, cardamom, cocoa powder. Serving size is 1/2 cup approx 42g. I’ve been making my own Muesli for over 30 years and so have now switched to Grain Free Granola. I have altered the recipe a little and don’t feel the need for the flavourings – just nuts and seeds with a little coconut oil. 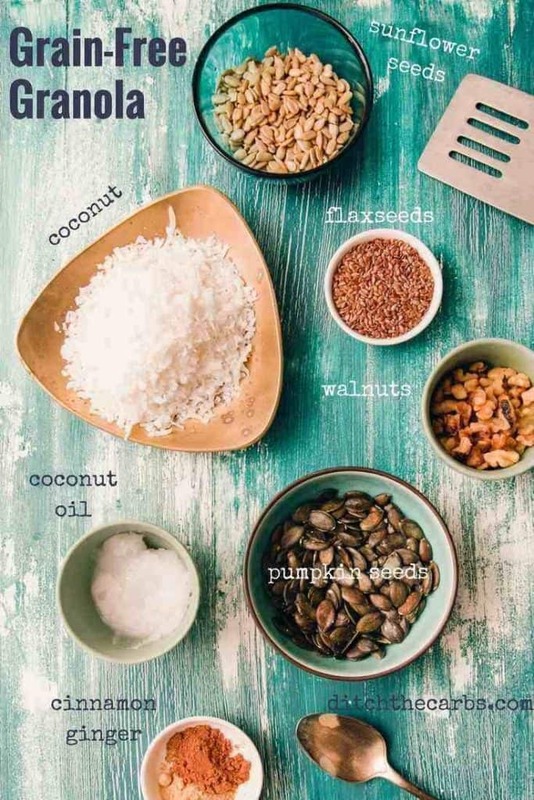 Because you know the coconut burns so easily, I roast the nuts and seeds for 10 minutes, stir, roast another 10 minutes, This gives time for the nuts to roast and then I add the coconut for the last 10 minutes, stirring after 5. I’ve also dropped the temperature to about 150-160c. I’ve always done it this way and never have a problem with the coconut or anything else burning. I’ve also cut back a little on the coconut oil as the first batch I made was much too oily. Hi, interesting post about cereals. I am looking for healthy alternative meal for my toddler, (18 months). Can you recommend this recipe? It’s nice that I am you can use it 4 ways, and cook different healthy food with the recipe. Hi, I was just wondering if this granola is suitable for Whole30? Sure thing. The beauty with this recipe is that it is so adaptable to adding/omitting ingredients. I made it today with random seeds and nuts found from the cupboard. I used olive oil, because I don’t like coconut oil at all. Turned out amazing! Thanks! Awesome result, I love it when readers make adaptations and “tweaks” to the recipes with great results. Is it possible to make this without roasting it? Reason is I want to avoid using any oil. Alternatively, can I just toast this on the pan for a few minutes without oil? Thank you, and looking forward to making it! Yes, you can make this without the oil and dry roast it, just make sure you watch it like a hawk! It will burn super easily. Can this granola or something else be used as a hot breakfast? ATM we have oat porridge so was looking for another porridge type breakfast. Otherwise I will cook oat porridge for my husband and I can have the granola. Yes, all you need to do is serve it with warm cream – yummmmm. What if you have pre roasted seeds and nuts? Can you just microwave it with the coconut oil to coat w/o the roasting part? If the nuts and seeds are pre-roasted, they may not absorb the coconut oil as the recipe intends. The shredded/desiccated coconut also soaks up a lot of the coconut oil when baking. Alternatively, why not just make a little mix of the roasted nuts/seeds that you have already, with some coconut and flavourings? More of a sprinkle mix for your morning yoghurt. that type of info in such a perfect means of writing? Calories don’t count in the traditional way – calories in vs calories out. The calorie theory has never actually been scientifically proven (see the article here). You need to ask “how do these calories affect my fat storage, hunger, hormones etc”. 100 calories from fat will keep you satiated, not raise blood sugars and provide you with the fat-soluble vitamins. 100 calories from sugar will spike your blood sugars, raise your insulin requirements and trigger appetite etc. So no, we don’t count calories, but do not take that as a license to overeat on what your heart desires. We eat until full, eat only when hungry, eat whole unprocessed food is the recipe to success. The Grams to cups conversion seems to be off. How does 250 grams = 3 cups of shredded coconut? I think I used way too much coconut, it doesn’t look like your picture. sounds right since coconut is quite light so cna imagine it would take 3 cups to make 250g. Did you weigh it? Yummy! Added 1 tsp each of cinnamon, pumpkin pie spice, and cocoa powder (and a bit of sweetener to balance out the bitter of the cocoa), subbed sliced almonds for the walnuts, and it turned out amazing! I have been on keto since the beginning of the year and have really missed cereal. This is going to be my saviour. Oatmeal is a low GI food – It causes a problem when sugar and sweeteners are added – I eat oatmeal every day with ground flax and it never spikes my sugar, keeps me satiated for like 3 hours and has lowered my blood pressure. I do not add any sweeteners to it. Foods lower than 54 on the GI are considered low. Oatmeal is a 51, Multi-grain bread – 48, Barley – 25, Brown Rice – 50. There are more. All these foods are in the Low GI range – they breakdown slow, keep you full and definitely do not make you fat or make you gain weight providing you are not eating too much – these foods combined with large servings of vegetables are excellent for one’s health. I can’t eat oatmeal, it spikes me, must try this though. Thank you so much for this recipe. Going low(ish) carb has lost me 17 points on my blood sugar, one set of medication and two stone in weight which has stayed off for more than two years. Your granola recipe has helped loads as I really missed the crunch at breakfast time and I love this. I have passed it on to lots of people both diabetic and those losing weight and all love it. It’s great making the bars too. Thank you for all of them. Finally, a great recipe with no sweetener. I added 1 tsp of vanilla extract and 3/4 cup of slivered almonds. I have it every morning over Greek Yogurt with frozen blueberries and a little almond milk and stevia. Soooo good, and perfect for my Keto Diet. Keeps my full for hours. Thank you, thank you! However we are a nut free household due to allergy. What seed would you recommend to replace the nuts. You can use anything really. It’s a very versatile recipe. My understanding is that flax seed needs to be ground to be utilized by our bodies, otherwise it isn’t digested. Also, I’m concerned about the elderly and diverticulitis with the unground seeds. Thoughts? Agreed! Whole flax seeds are the biggest con in health right now, because they just go right through our bodies without being digested. I am a GI nurse. You can eat seeds and nuts with diverticulosis. That is an old wives tale. If you have diverticulosis we recommend a high fiber diet. Most high fiber foods have seeds in them. Eat to your heart’s content. Thanks sooo much for this recipe! I have been making this for a few month now, and I’m addicted! 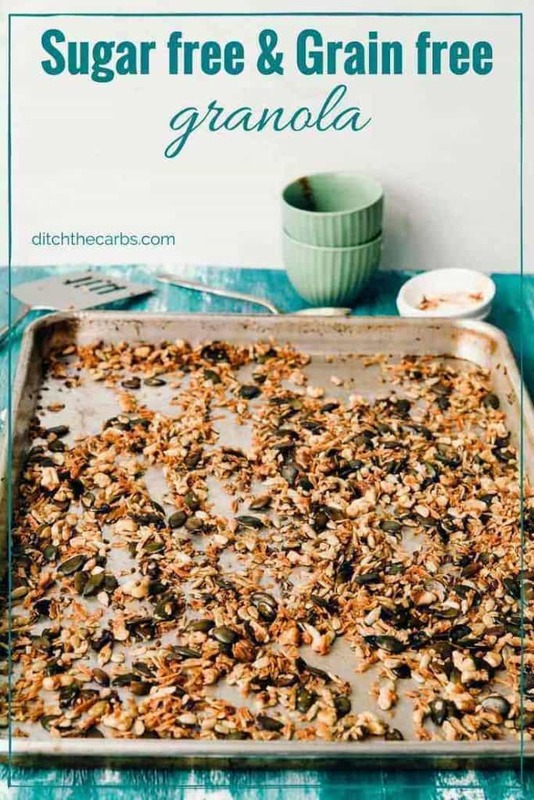 I make a low carb granola and use it to top my “cereal”. I have been eating low carb for probably 8 years or so, and missed cereal a lot. Every night, I really look forward to breakfast! Thank you again! Thank you Libby for bringing these amazing recipes into our kitchens around the world! I am wondering about how long the batches will “last”. I would think all the ingredients are shelf stable and so would be okay to leave in air-tight containers until completely consumed. Does this granola go bad? If so, what do I look for? And can keeping it in the fridge make it last longer? Many thanks! Should I continue to cook? It tastes great! Do I store in the fridge? Is it wet or oily? Any excess coconut oil is soon absorbed by the coconut as the grain free granola cools. Do I continue to cook unitl it’s completely dry? I cooked it for 25 minutes and it’s nicely golden but still looks wetish, tastes amazing ! After hip surgery, my normally well-controlled blood sugar began spiking to 150 and above. Desperate, I began rigorous post-prandial testing. For decades, I have assumed that my standard “low carb high fiber” sugar was the perfect breakfast. I was stunned when I saw readings of 180 and above. So after a long search for a true low-glycemic alternative, I whipped up a batch of the coconut fennel granola. I didn’t think I’d like the taste, but it’s delicious! And my post-prandial readings are 110 to 155. Wow! And thank you! Marion, this is fabulous news! Love your recepies. Super healthy and practical. The only confusing thing is the use of microwave. It is totally unacceptable from health point of view. Why spend mpney on organic ingredeients if microwave is going to change its complete chemistry and make it toxic?! Thanks for this great idea! I am working to get my family to see how harmful cereals are. At this point, they believe the hype. Also, thanks for a very reasonable and informative post on the use of microwaves. I assume that most of your readers are adults and if they don’t wish to use the microwave, THEN DON’T. This is not the place to voice your opinion (and it’s only opinion) on the use of microwaves but only the experience you may have had with this recipe. I juat stumbled upon ur crecipe..can you please clarify of u used sun flower n pumpkin seeds wdout shells?? Hi Libby. Could you please advise if your granola is suitable for diabetics? My grain-free granola is suitable for everyone who has a carbohydrate intolerance as they are free from sugars, grains and other high carb ingredients. Many T1, T2 and pre-diabetics enjoy all my recipes, as well as those trying to prevent T2 and insulin resistance. Libby can you let me know what you think about soaking seeds. I found a site that mentioned seeds are best soaked overnight and then dried to release phyto.? .sorry can’t remember what they called the chemical that soaking got rid of. That we benefitted from that process. If you have any thoughts i sure am interested to hear. Yes you can soak seeds, however I am never organised enough to do this. As I understand it, soaking can remove any phytates and enzyme inhibitors. Thanks Libby. I so value your work. Keeping it real too. Is there something I can use as a substitute for the coconut? I cannot swallow nor easily digest coconut flakes or shreds without gagging. Many low carb recipes call for alot of coconut. A common sub would be great or does it depend on the recipe. Thanks. You could try just making your own blend of your favourite nuts and seeds fro gran-free granola. Add flavourings, sweetener (if required) and bake. None of the food that we eat today, be it meat, vegetables, fruit, roots, tubers, etc. are the same as that eaten by our ancestors, even if you are a traditional hunter / gatherer like the Hadza or Kitavan. So that is a poor argument against the consumption of whole wheat. There are other better arguments. The best one is from dr Davis’s Wheat Belly and I believe that’s what she meant. He gives compelling arguments re why wheat is poison. You’re awesome! And so is your son, congratulations. Sending kids carb and sugar loaded isn’t going to help anyone, let alone their poor concentration and empty tummies an hour later. It sounds like you have got him all organised with a fully loaded tummy and brain before the exams, cereals and grains were never going to do that. The shift is coming to increasing healthy fats, good protein and lowering sugars and grains, albeit slowly. Carb loading our kids, is on the way out (I hope) but at the moment, I agree, it’s like hitting your head against a brick wall. Hi LIbby thanks for busting all these myths that have left me confused for a while. I’ll definitely be trying this recipe. I was just wondering what’s your take on natural non-sugar sweeteners such as stevia – for those of us struggling to kick the sugar habit. I’m so glad you found the article helpful, it certainly is hard to explain simply why cereal should be avoided and why it certainly isn’t a great way to start the day. 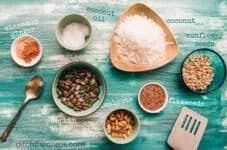 I have an article you will find really interesting, my Ultimate Guide To Low-Carb Sweeteners. I discuss what I use and what I avoid. Personally, I choose sweeteners that don’t raise blood glucose, but in minimal quantities, and not to be relied on heavily and regularly. Just made this in a frying pan and worked great! On a low heat and kept it moving so didn’t burn. Look forward to brekkie tomorrow! I cannot wait to make this tomorrow! I miss cereal so much. How much is a serving? Half cup? Yes, about that. You can sprinkle it on natural yoghurt, add some coconut cream and a few berries – yum. This sounds great! I’m not a big fan of coconut oil, I just don’t like the taste. What would be a good alternative to coconut oil? Would Olive Oil taste funny on it do you think? I use the tasteless coconut oil so it’s quite bland, and yes, olive oil would be too strong. How about butter if you’re not Paleo? That would be tasty. Really you can add whatever you like. I tend to throw together whatever I have in the cupboard – for example, sunflower seeds, pumpkin seeds, LSA, ground almonds, chia seeds, psyllium husk etc. Go for it. Thank you for this (and so much more, Libby). My pleasure, I love creating everything here. Thankyou Libby! Finally got around to making this and it’s really fabulous. I didn’t have linseeds, sunflower seeds or walnuts so used sesame seeds, chia seeds and pecans and I love it. I was looking for something crunchy to have with my daily blueberries and greek yoghurt and this is perfect. Great recipe. Hi, just a quick query. The recipe calls for linseeds, but the pictures of the ingredients include ground flaxseed. Can you confirm if it is made with whole or ground linseeds? You can use either, I just throw everything I have in the mix. I generally have it with some natural unsweetened yoghurt and coconut cream (to increase the fat to keep me full). I’m so glad I can feed and entertain you at the same time 🙂 Enjoy. I am from Germany and I stumbled across your Blog because I have PCOS and due to that insulin resistance. I was always so tired and in a bad mood and I was so sick of taking drugs. So I started eating LCHF and went off the drugs. Just yesterday I got my first regular period (without taking any hormones) in 6 months. It showed me that low carb is the key – and the weight loss is a bonus, too! Thanks for all your work! I really appreciate the information! Kathy I am overwhelmed by your amazing results. I try and tell so many people that LCHF helps with their hormone issues but they simply won’t believe me. I bet you must be feeling on top of the world. How incredible the power of food has on our body, both for the damage it can do and the health it can bring. Congratulations for coming off the drugs, weight loss, periods returning and feeling fantastic. Sending you my warmest wishes. Thank you! Yes, I am feeling fantastic and I will spread the word! I know its hard to convince people. I guess deep down inside they know its true but they are just too comfortable to make the changes. And going without carbs must be like rehab for some of us. But I started by “de-carbing” one meal at a time and I also have little treats from time to time. It also helps that my boyfriend is on board (even though he has no health issues) and even he is feeling better and much more active! I did use desiccated coconut as my supermarket didn’t have flakes, don’t know how easy they are to come by in the UK, and I used walnut oil not coconut as I nearly fell on the floor when I saw how much it is, and as I recently lost my job I can’t justify it yet, but no doubt I’ll give in to it sooner rather than later! Thanks for all the hard work involved on your site, I’m really looking forward to trying more recipes. Hi. I am from the UK and got coconut flakes from Holland and barrett. Totally changes the texture of this granola. Also you can get coconut oil from aldi for I think 2.99 or 3.99! Hi Libby, I remember as a child every cereal box came with a toy. My kids ask why they don’t come with toys now. I explained that’s how they got us hooked. They don’t need to add the toy anymore. Now we think we can’t live without boxed cereal. I am a witness to the cheap grain. We are actually farmers (5th generation). we just sold our soft white wheat (cereal wheat) for $3 a bushel cost of growing $5 a bushel. So we lost big time. I’m sure the boxed cereal went up. But we don’t subscribe to our own product. We eat lchf for our weight and heart. We don’t even know what we could do for a living because that’s all my husband knows how to do. And there is no place to sell other crops and make a living. Love your site btw. Lots of great information. Sharon D.
It breaks my heart to see our farmers treated so badly. I can’t do anything to stop the big corporations but just wanted to say thank you for sticking it out on the land. We need our farmers. I know the hours are long and work is hard. I appreciate your family’s dedication. Believing for a turn around in the industry and crop options for you. 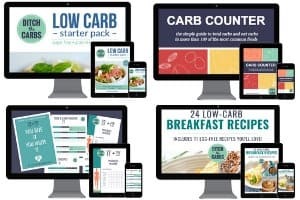 I’ve just found this website and love it as I’m starting to ditch carbs. Thanks Libby. 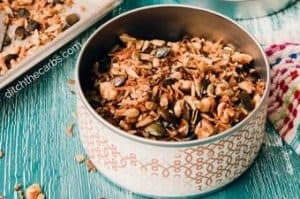 I’m conscious of the high levels of saturated fat in coconut, so instead of coconut oil in this granola recipe, would this work with olive oil or other oil low in saturated fat? Saturated fat is a good healthy and stable fat. Read this article on why saturated fat has got a bad reputation, unfairly. It explains why saturated fat is so stable. She has a wealth of knowledge, you’ll get hooked reading over there. I really want to make this, but I have a question about the ingredients…I’ve done a lot of research on flaxseeds and the only way you really get their nutritional value is if they are ground. So I guess my question is why bother putting whole flaxseeds into a recipe if you’re not going to get the nutritional value? Is it for flavor? Thanks! 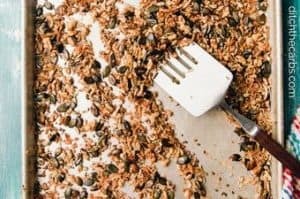 You can use whole or ground flaxseeds in this recipe, either way they will get chewed and ground by eating the granola. Made this today with almonds, chia seeds, pumpkin seeds, sunflower seeds and unsweetened coconut chips. I did add a couple packets of stevia for a little sweetness with the cinnamon and ginger and it is delish! This is so yummy. My husband has an egg intolerance so eggs are out for him for breakfast. This is a great alternative. Are your nutritional panels UK format or USA format? Has the fiber been subtracted already from the carbs? They are total carbs. A great question as I used to use MyFitnessPal which uses a random selection of both total and net. I now use chronometer.com which is far more accurate. What are net carbs per seving? Is the fiber already subtracted from the total carb in your numbers? Thanks! These are total carbs, then subtract the fibre if you need the net carb value. Hi! I just made this as a present for my mother in law, who is on a restricted diet. It smells and tastes great. But… I would suggest that 20 minutes at 350f is way too long to bake! Luckily I set my timer for 10 minutes so I could stir the mixture and the coconut flakes were just right then. They would have burned with another minute or two. I love those jars! Can you tell me where you got them from? They are actually bathroom storage jars for cotton wool from Bed, Bath and Beyond. (I’m always on the lookout for food styling items, no matter where I am). I absolutely love this mix. I changed it up a bit by adding sugar free dried cranberries found here: http://alldayidreamaboutfood.com/2012/11/stocking-your-low-carb-pantry.html that I made myself. It’s my go to breakfast or lunch. thanks so much for this. I used to be such a cereal-holic so if someone had told me 3 weeks ago that I would be eating left over steak and cabbage for breakfast this morning, I would have laughed in their faces! Very pleased with myself that I didn’t need to eat the entire steak last night either, just didn’t need it. I am loving this feeling, so balanced and satisfying! I just made this yesterday. Had it for breakfast 🙂 I mixed the yogurt with a bit of vanilla and cinnamon+sweetener and it was YUM. I did add some hazelnuts to the mix, and couldn’t find coconut flakes so used desiccated coconut (which is more like fine, almost powdery shreds here in the UK) and it worked. Hoping to try the chocolate version to eat with raspberries soon…. OMG! I love this! Thanks again for your great recipes. This looks so good!. I love cereal, but not all those carbs. What would be a good substitution for the coconut flakes for those who hate coconut? 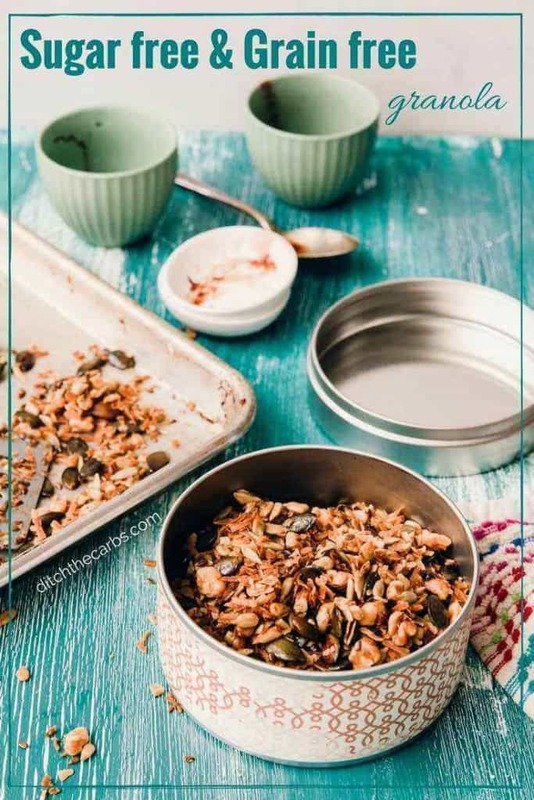 You can add plenty more seeds and nuts that you like and can tolerate, but unfortunately the granola is heavily based on desiccated coconut so the recipe will be entirely different. It would end up to be more of a toasted seed/nut mix which may actually be really great! Leave them plain or add cinnamon/cocoa/vanilla or any other combination of flavourings. 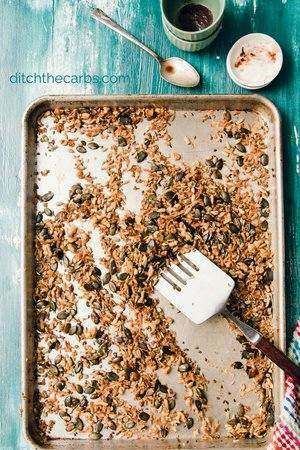 I am not a coconut fan either, but when you make this granola, or another granola recipe that I found, when you bake it, the coconut ends up being one of my favorite ingredients. It gets yummy crispy and I end up loving the coconut. I also hate coconut and used ground almonds instead of dessicated coconut. Still cooking (40 minutes and counting but my oven is rubbish!). Will let you know how it works out. Hallelujah…. have been ranting about hideous cereals for a while and how sucked in everyone is about them. My friend posted this link to my FB page and am going to hug her when I next see her. Hi Kirstie, Thank you so much for the kind feedback. The Heart Foundation tick is hopefully on the way out. http://aca.ninemsn.com.au/article/8759175/experts-fight-for-heart-tick-removal I’ve just found another video you will love. The children explain how badly sugar and high carbs affect concentration. http://www.fathead-movie.com/index.php/2014/06/23/fat-head-kids-club-sugar-and-concentration/ Libby. Do you serve this granola with anything in particular? I generally have it with a cup or less of berries, some low carb yoghurt and some coconut cream. I also add it on top of chocolate whipped cream and berries for a quick dessert in a glass (my children love the chocolate grain free granola for them). Just thought I’d add to this! I’ve been adding mine to my smoothies…. bananas, frozen blueberries, spinach leaves (odd, I know, but it works!) & a splash of milk. You can eat it with a spoon… delish! Thanks for adding this great idea Kirstie! Love it.